The TECNO Camon CX Air android smartphone has been unveiled same day as the TECNO Camon CX. Been powered with the best features out there, the latest addition to the Tecno Camon series shows a family resemblance to the Camon portfolio. But the Air is a smaller version of Camon CX. Tecno mobile is bent on ensuring we get to see a new android phone that can compete favorably with its long-time rival, Infinix mobility every month. In September, it was Tecno Phantom 6 and Phantom 6 Plus that went live in October last year, the Tecno Camon 9, and W5, as well as the Tecno Camon C9 plus, C8, C7, and C5 in the Cseries. The Tecno Camon CX Air is one of the slimmest smartphones around at just 5.6mm thin. It is also camera focused with a 13MP camera on the rear and front, specifically designed for selfie lovers. Tecno Camon CX Air features a 5.5-inch display with 720 x 1280 pixels resolution. Though it features a similar camera setup on the back like the Tecno Camon CX, the sensors have been downgraded from 16 megapixels to 13 megapixels. That said, the rear camera on the Tecno Camon CX Air is expected to offer some improvement over the rear 13MP camera provided for the Tecno Camon C9. 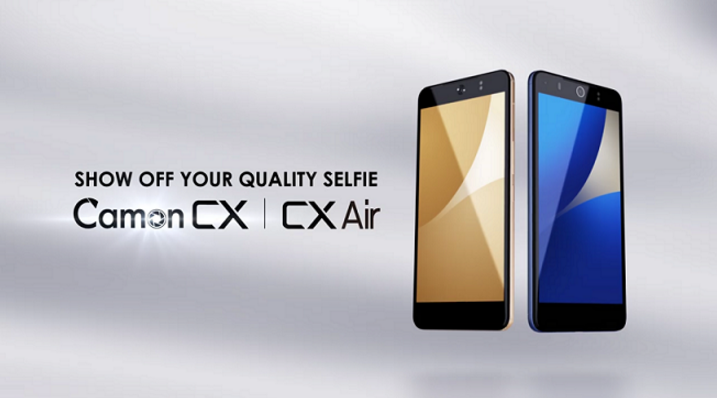 Tecno Camon CX Air also has a 13 megapixels camera for taking selfies. Both cameras offer dual-LED flash. Tecno Camon CX Air runs Android 7.0 (Nougat) on a 1.25GHz quad-core processor with 2GB RAM. It sports 16GB built-in storage with support for up to 128GB memory card. Tecno Camon CX Air supports 4G LTE and it loaded with a 3200mAh battery. Tecno Camon CX Airsupports 4G LTE on all LTE networks in Nigeria including Glo, MTN, NTel, Etisalat, Smile, and InterC. I like the specs of this device. I heard it just entered our markets though. This is more mid-range than the CX. Why didn’t they release this one first na?